I hope you had a great Christmas with the family. I thought I would show you these great pictures compared to June of those legs. There is a big difference." 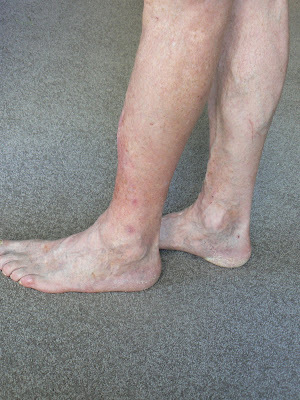 condition of his legs. We began a programme based on nutrition and self massage. The last two photos were taken late December 2008. Correct - many, many years ago; but only for one leg. The overall problem has a systemic causation.